We want ProPhoto users to get started with a good website experience so we’ve partnered with a hosting company we trust who will provide you with excellent benefits. Your $30 rebate is credited after your purchase & registration. Also, if you want to use website address other than .photo, you can register for any other domain in addition to or instead of the free offer. When you first begin using ProPhoto and register the software, click the option to request your hosting rebate. We will process your rebate as a refund against your original ProPhoto purchase and it should appear on your credit card or PayPal within a couple business days. Why do you recommend HostPapa? WordPress and ProPhoto come preinstalled so you can login and get working – just signup after purchase through your ProPhoto account page. 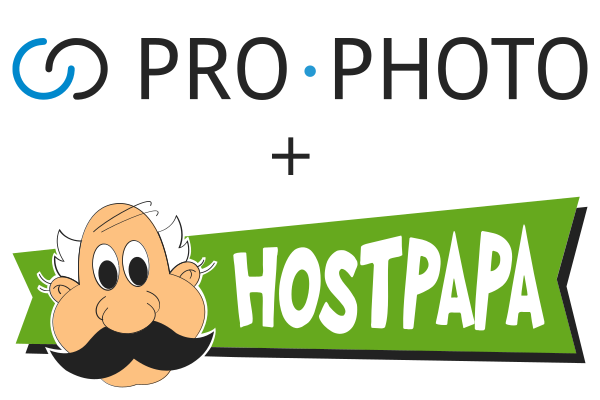 HostPapa has worked closely with us to provide a managed WordPress hosting plan customized for ProPhoto users! Fast web servers with the option for unlimited storage and bandwidth, and fewer technical problems. HostPapa will move an existing WordPress site into your new account for free if you’re switching from an existing setup. Our support team knows the ins-and-outs of HostPapa hosting so we can provide faster help, if necessary. Since we have an affiliate relationship with HostPapa we can pass a $30 savings on to you. This only applies for new hosting account types listed on the landing page linked from the HostPapa button above. If you signed up for HostPapa a while ago, or if you choose a different hosting plan, unfortunately we’re not able to apply this rebate. You may not combine this offer with any other Hostpapa discounts or promotional pricing while signing up for web hosting service.